This will be the first exhibition VMFA has ever presented of one of Virginia’s most celebrated contemporary artists, Sally Mann. The exhibition which opens November 13, 2010 and runs through January 23, 2011, focuses on the theme of the body and emphasizes Mann’s new work, while selectively introducing earlier images. 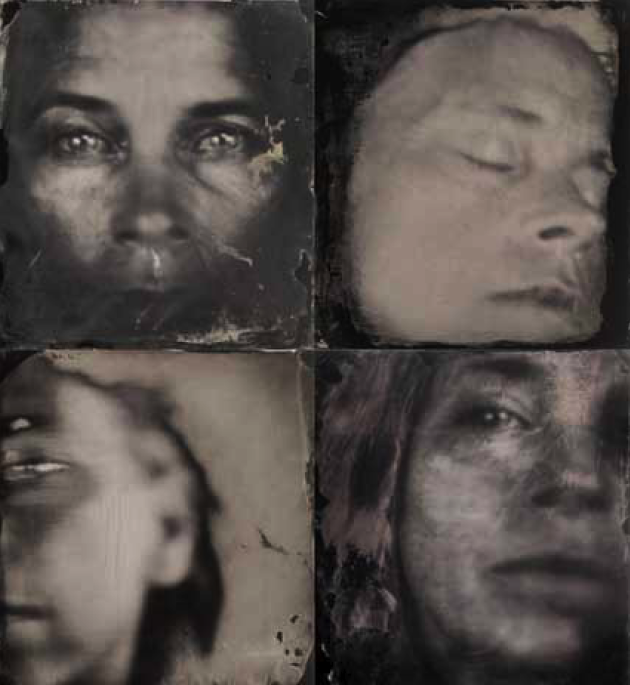 Sally Mann’s most recent work represents an intriguing new direction. She is tackling expansive themes of mortality and vulnerability, while for the first time using herself and her husband as subjects. In addition, she has taken her bold experiments with the medium to new heights, pushing photography to its limits by making painterly and nearly abstract images—many as unique pieces on glass plates. Untitled Self Portraits – Ambrotypes (unique collodion wet-plate positives on black glass), with sandarac varnish. Altogether the exhibition and accompanying catalog will present an unexpected picture of Mann’s work, encouraging a fresh perspective on one of today’s preeminent photographers and, it is hoped, an opportunity to extend her visibility well beyond the realm of photography. Sally Mann: The Flesh and The Spirit, co-published by Aperture and VFMA, is a must for any serious library of photographic literature, students, scholars, collectors, and others interested in her work. John Ravenal has written a comprehensive introduction as well as individual entries on each series, and essays by David Levi Strauss (“Eros, Psyche, and the Mendacity of Photography”) and Anne Wilkes Tucker (“Living Memory”) add different, but equally illuminating perspectives to this work. About the artist: Sally Mann was born in Lexington, Virginia, 1951. She is one of America’s most renowned photographers. She has received numerous awards, including NEA, NEH, and Guggenheim Foundation grants, and her work is held by major institutions internationally. Mann’s many books include What Remains(2003), Deep South (2005), and the Aperture titles At Twelve (1988), Immediate Family (1992), Still Time (1994), and Proud Flesh (2009). She lives in Lexington, Virginia. New York Old Homestead Steakhouse created this Lady Gaga inspired meat dress which uses higher quality cuts of prime meat than Ms. Gaga’s “work of art” apparently had. The 85 pound dress was stitched together by restaurant staff and is accessorized with a necklace of marrow bones topped with a 32-ounce rib eye chapeau. A porterhouse on top, rib eye leggings, and kobe beef boots- all USDA prime, are part of the ensemble. One can wear the dress and then have a gluttonous amount of meat to eat afterwards; Old Homestead Steakhouse recommends freezing the steaks. All this can be yours for a heft price of $100,000.